The fifth edition of Canada’s biggest Euro show took place yesterday at Circuit ICAR located at Mirabel airport 45 minutes North of Montreal. 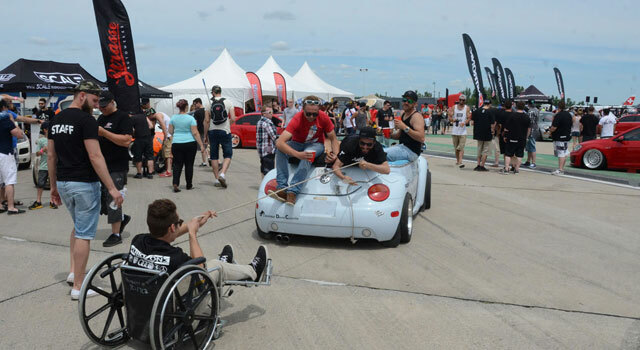 Eurokracy was held at Autodrome St-Eustache for its first two years then Napierville Dragway for its next two years but the event has gotten so big that neither track could hold the amount of people who turnout. ICAR has enough space and then some so the decision was easy. Eurokracy is cool because every vehicle driven to the track takes part of the event in some fashion. If you aren’t part of the vendor or show area, you are part of the spectator parking that functions like one huge car meet. There are things you see at Eurokracy that you just don’t see anywhere else like the hot tub vehicle, the Beetle with two front ends and cars that are so low they scrape the ground simply by moving. The weather cooperated and this year’s event raised the bar even higher for this show. Enjoy our coverage below. What we try to do is take photos that give the viewer a real sense of what it was like at the show so you’ll see many panoramas and photos and things that aren’t necessarily “nice” but do give a good impression of the experience.